Yes, you read it right - only today (Friday) and tomorrow (Saturday 31st) to make the most of this year's Sale-a-bration promotion. Then it will be gone until next year. I've had so much fun over the past three months bringing you projects using the FREE Sale-a-bration products. And if you follow my blog regularly, you'll be in no doubt that one of my favourites has been Lots of Lavender. If have another project using this set to show you today. This is one of the "Make and Takes" we made at a recent training event, designed (I think) by my third level upline, Michelle Last. 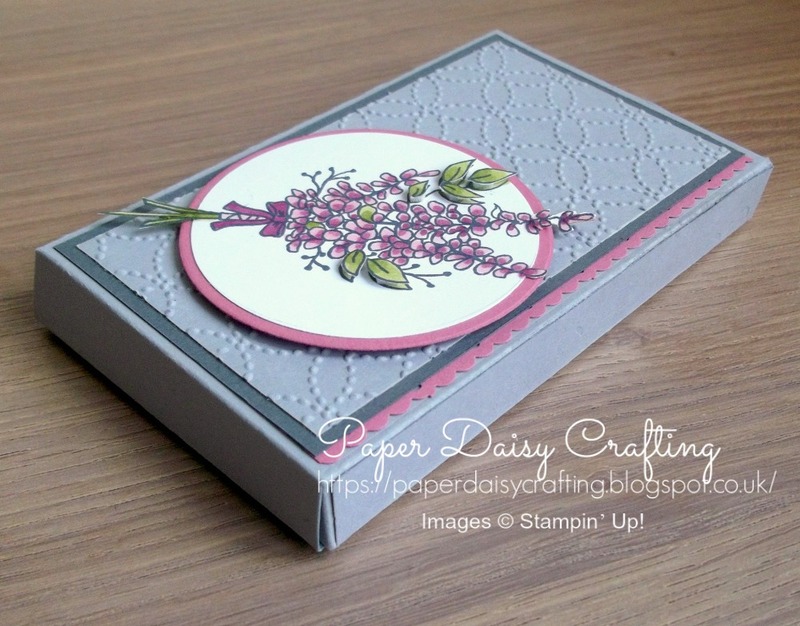 I have used the "Lots to Love" Framelits dies and of course the Lots of Lavender stamp set. 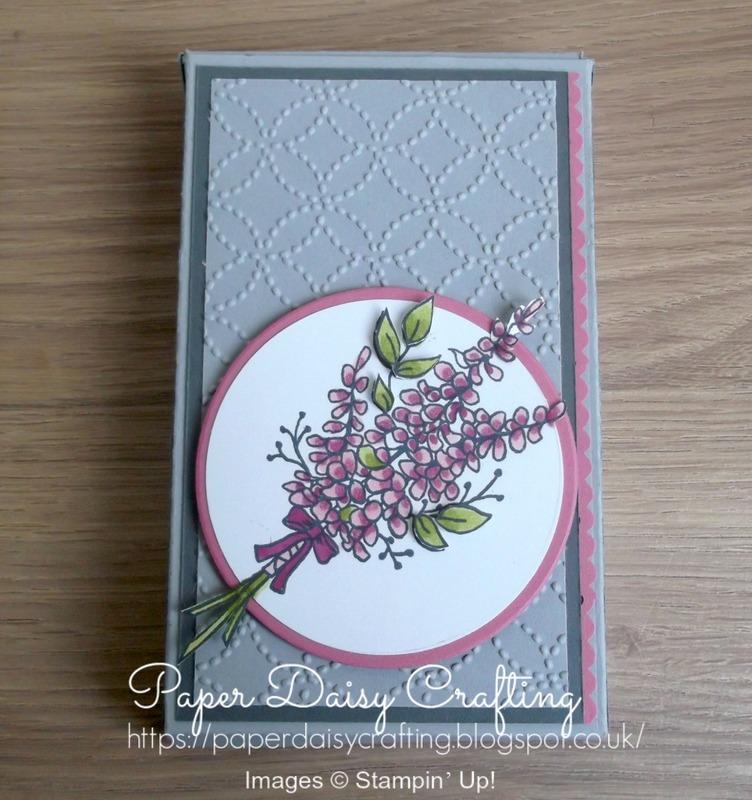 I'm loving the colour combination here - Smoky Slate, Basic Grey and Sweet Sugarplum. Pretty! Oh and I have one more Lots of Lavender projects to show you. 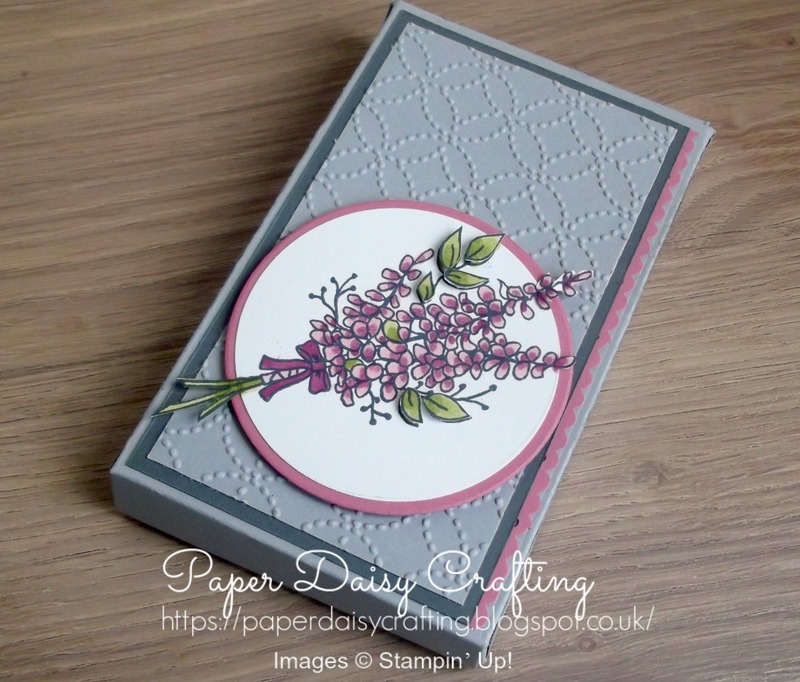 This is an image supplied to us by Stampin' Up! head office and it is so pretty. 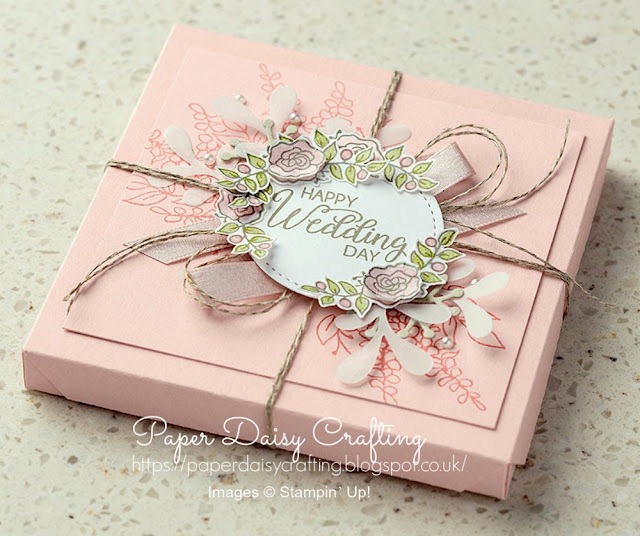 Although it is a box, the same design could easily be adapted into a card - who wouldn't like to receive a gorgeous card like this on their wedding day? And there's that often overlooked little rose spray too! If you are tempted, you could buy the Lots to Love Framelits dies (£30) and the coordinating Heart Happiness stamp set (£15) and get the Lots of Lavender (or any of the other available Sale-a-bration products) absolutely FREE! Please don't leave it too late to order (or to join my team and gain two extra FREE stamp sets!). There will be a rush of orders tomorrow so the website will be very busy. I'll be closing off this month's shopping code at 12.00 midday (UK time) tomorrow so please get your order placed before then if you want a free gift from me next month - I have lots to send already but would love to add yours to the pile! To shop online, simply click "Shop Now" button on the top of this page to go direct to my online Stampin’ Up! shop. If you order from my online shop please use my monthly shopping code (below) to receive a free thank you gift from me as I really appreciate your business. The code will be closed off at 12.00 midday on Saturday 31st March.